It's been requested by Zwifters everywhere, and we have been listening! Today, Level 50 has arrived! It's time to start chasing those new levels and see how high you can go. Just like before, each level gets harder than the last so keep the pedals turning over to achieve more levels. Don't fear though, we will be giving you credit for all the hard work you have done since you reached level 25, more on that below. 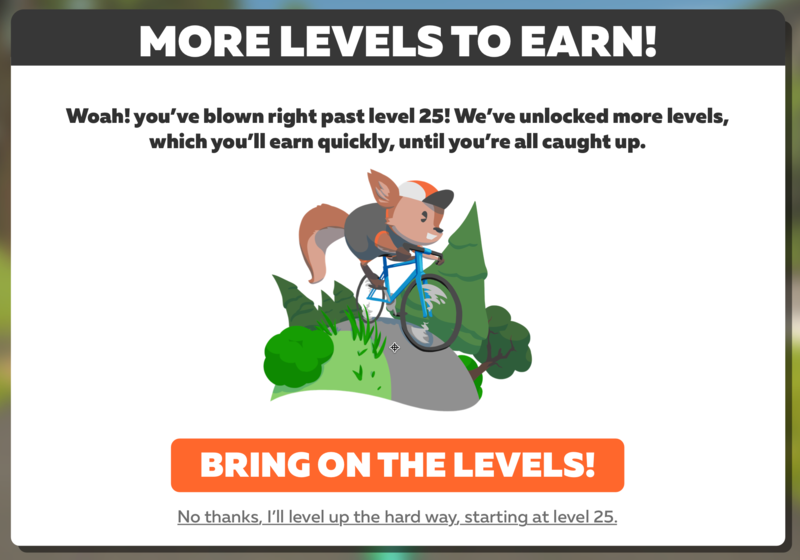 Zwifters below level 25 won't notice any changes but if you're already level 25 (or above) you'll be faced with a choice the next time you login. Based on the miles and kilometers you've already logged, you will be allowed to chase the new levels on an accelerated path of XP gain, but only up to the level you would have achieved before the levels update. Or, you can opt out and chase all the levels at the normal rate but choose wisely, either way is a final decision. Keep chasing the new levels with new awesome unlocks to provide even more ways to personalize your avatar.